Over the past couple of years, we’ve had more and more customers start building applications that run on Microsoft Azure. While doing these projects we noticed that there were components we had to implement over and over to build a boilerplate for our applications. Of course this meant we were doing the same thing over and over again. So we decided to do something about. Our goal with Arcus is to fill the gaps that we consistently experience, so we don’t have to reinvent the wheel each project. If there is already a component or library that does the job, we prefer to support that community. Let’s have a quick look at how easily we can push events. It would be easier if we could just push events via HTTP, without having to worry what the endpoint is and how to authenticate. This is exactly what Arcus Event Grid Proxy does. It is a simple Docker container which accepts HTTP requests and will forward it to the configured Azure Event Grid topic. By using a Docker container, you can basically deploy it wherever you want – be it on Service Fabric Mesh, as a side-car in Kubernetes, on-premises or simply on your laptop for local testing. 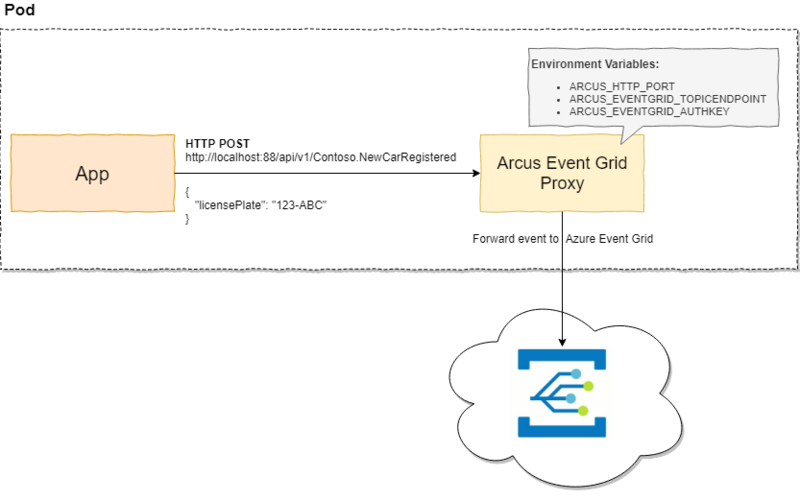 The beauty is that not only does it allow you to easily get started, it also allows you to send events to Azure Event Grid that don’t yet support it, without having to implement and run your own code on Azure to achieve this. Different use-cases require different image tags, that’s why we provide three flavors of them. Security is one of the most important aspect when building applications, this is no different on Microsoft Azure! This will be stored in an in-memory cache so secrets are not leaked and it is configurable to fit your needs. While we already have some components covered, this is just the beginning.